I can’t help but to keep telling people about this place, Spider House in Boracay Island. 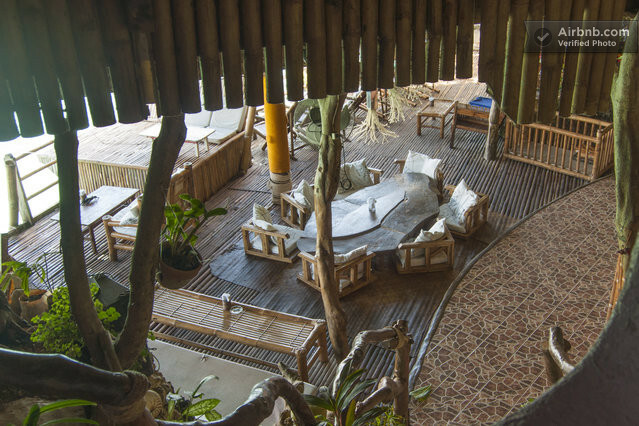 It’s one of the unique places to stay because the house / rooms are made with bamboo and wood, like a huge open-plan tree house built on the rocks at the base of a mountain directly over the sea. It blends in naturally with its surroundings. We stayed here for 2 nights before heading to the main White Beach. The best feature could be that you can dive straight into the sea from the deck and watch spectacular sunsets from one of the best spots on the island while enjoying a cocktail from our bar. There are over 12 rooms in the house that are all unique and they all have stunning views out to the sea. It’s not the luxurious type of room with aircon or nice shower heads or even TV. The rooms are fitted with fans and mosquito nets to keep you cool at night. Erm, but I must say, you are never alone in the rooms. Ants, spiders, mosquitoes and possible other insects are there to accompany you in your room. Heh. The view makes up for it for sure. The water outside Spider House is probably about 6 – 7 ft deep. You could swim all the way behind Spider House to West Cove, and other hotels nearby! There’s also a bamboo platform to relax on. Great spot to catch the sunset, or sip a Mango Daiquiri, or San Miguel. There were 3 of us so we opted for the Bamboo Suite room with sea view which comes with 2 large single beds which can actually acoomodate 4. But when we arrived, there were 3 of the large single beds. The rooms were at USD110 + USD12(extra adule) per night with complimentary breakfast. Now heading to Spider House wasn’t that easy. When you are at the end of the road to Diniwid Beach, it’s quite a long walk (10-15 minutes) on the beach, to the cliff, then a couple of staircase to the entrance. Not for those with large luggage. Our stay comes with complimentary breakfasts, choice of local or American style breakfast. Pineapples and Mango in season were really sweet. On our 2 mornings there, we make sure we had our swimsuits on when we get down for breakfast. Cause we’re definitely getting into the water after that. I wouldn’t say the other food there served was great. But because Diniwid Beach had very little choices of dinners, we opted for dinner in Spider House on the night we arrived. But, as a word of warning, the food takes 30-45 minutes to be ready. I’m not kidding. Board games and beer while waiting for food ? Spider House is also ranked #12 amongst the hotels in Boracay in Trip Advisor. Also voted as Traveller’s Choice 2014 for Bargain Hotels. I must say, though the room did not have aircon, or a little run-downed facilities, the uniqueness of this eco-friendly bamboo treehouse with spectacular view and crystal clear water definitely makes up for it. OR search for more hotels in Boracay. PS: If you’re on Bloglovin, do follow me here.